It’s those London buses again: you wait ages for a No. 7 and three turn up in quick succession. Ádám Fischer’s, with the Düsseldorfer Symphoniker, arrived first (C-Avi), followed by Mariss Jansons and the Concertgebouw (RCO Live). Now we have this one, from Ádám’s brother Iván and the Budapest orchestra. The latter’s cycle, years in the making, seems to be at an end, even though it doesn’t include the Eighth and Tenth; Ádám’s still has a way to go, with Nos. 1, 3-5 and 7 completed thus far. 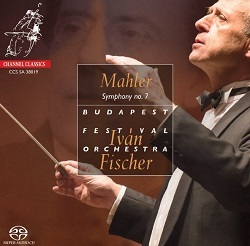 And, as part of their own Mahler projects, we can expect Sevenths from Thierry Fischer (no relation) in Salt Lake City (Reference), Osmo Vänskä in Minneapolis (BIS), Daniel Harding in Stockholm and François-Xavier Roth in Cologne (both Harmonia Mundi). As expected, there’s plenty of competition. I particularly admire Michael Gielen’s Seventh - the 1993 Baden-Baden one for Hänssler, not the Berlin remake for Testament - as it really draws the listener deep into Mahler’s unsettling soundscapes. Indeed, if you’re looking for a good all-round recording pf the work, secure in its idiom and certain of its goal, then this should be on your shortlist. (It’s now included in Vol. 6 of SWR’s Michael Gielen Edition.) That said, I’m still very fond of Claudio Abbado’s Chicago/DG Seventh; it’s just so engaging, with a buoyancy and wit that I don’t always sense in his Berlin and Lucerne versions. As for Leonard Bernstein’s two New York recordings, for CBS-Sony and DG, I find his earlier take rather less eccentric than his later one. And then there’s Otto Klemperer’s (in)famous New Philharmonia recording from the 1960s; at 100 minutes it shouldn’t work, but I think it does (EMI-Warner). Now, given that Ádám and Iván have both recorded the Seventh, I was sorely tempted to set up a ‘head to head’ between them. Alas, the former’s performance, well played and recorded, simply fails to convey the score’s abiding strangeness, its quirks and quiddities. That’s probably why a venerable Gramophone critic dissed Jansons’ new RCO version; granted, it’s not the most probing account of this intriguing piece, but the Latvian’s lightness of touch ought not to be confused with superficiality. Indeed, this conductor is seldom this affable and communicative, and that yields many unexpected rewards. It’s also magnificently presented, the RCO confirmed as one of the world’s truly great Mahler bands. As for Iván, I’ve not always been persuaded by his Mahler, but given the extraordinary range of this repertoire it would be a miracle if I were. That said, I treasure his easeful, wonderfully transparent Budapest Fourth, successfully reprised with the Concertgebouw a few years later (RCO Live). But his recent BFO Third, actually recorded a year after the Seventh, is in another league entirely. Such are the revelations in this oft-played and much-loved work, it goes straight to the top of the tree. Not surprisingly, I made it one of my Recordings of the Year for 2017. It’s worth noting that Roth’s Gürzenich performance belongs there too (Harmonia Mundi). Of course, the Seventh is a very different piece, with its own set of challenges. Iván’s first movement is spaciously conceived, with a full-fat tenorhorn, alert phrasing and a pleasing sense of purpose. His strikes me as a considered approach, in every sense of the word, but that’s not so suggest it’s without nuance or character. Some may prefer a freer, more seamless line, but at least there’s no shortage of ear-pricking incident. Hein Dekker and Jared Sacks’s judiciously balanced, ‘hear through’ recording is a great asset in this respect, Mahler’s smaller, easy-to-miss epiphanies beautifully caught. As for the playing, it’s beyond reproach, with ravishing harps and well-blended Wagnerian brass. Iván’s opener also seems darker than some, but then, like Gielen, he doesn’t shrink from the music’s equivocations; in short,, he forges a much tougher, more absorbing narrative here than most. The first Nachtmusik is nicely pointed, with some lovely will-o’-the-wisp contributions from the woodwinds. What a gallimaufrey of frisson-inducing orchestral effects, all combined into a most compelling whole. At this point, I must concede that, as much as I like RCO/Jansons, Iván trumps him at every turn. Take that weird, wall-eyed central movement, for instance, which the Hungarian paces, shapes and animates to perfection. The second Nachtmusik, articulated with real affection, is no less alluring, its Wunderhorn echoes especially evocative. It’s all delivered with a fluid confidence, rooted in a profound ‘connection’ with the composer’s oeuvre. Gielen displays comparable wit and insight, although the German players aren’t as polished as their Hungarian counterparts; the Hänssler/SWR recording, although decent, isn’t as revealing, either. Watching Iván in the concert hall, one can see that he really enjoys what he does - no faux seriousness here - and that shines through in his natural, rather liberating response to this varied score. His comprehensive skill set includes a keen sense of shape and a good ear for inner detail, both essential here. Even more remarkable is his ability to linger just a little, to examine carefully what he finds, without compromising pulse or line. That’s particularly true of the ‘night music’, the second strand of which fades quite magically at the end. Iván rounds off with a rousing but well-disciplined finale. And what a sunny summation it is, those bucolic bells - heard as if across verdant pastures - more uplifting than ever. Happily, the sound is superb, without ever calling attention to itself. We’re only three months into 2019, and, much to my surprise and delight, I’ve rediscovered two great symphonies. But the all-encompassing excellence of Iván’s (and Roth’s) latest is a depressing reminder of how many dull Mahler recordings there are, quite a few of which have come my way in recent years. No, that’s a debate for another day; right now, it’s time to celebrate! Iván follows his revitalising Third with a similarly talented Seventh; as before, the engineering is first rate.